Tacoma’s Multi-Care Building is using the Integrated Steel Design system developed by Putnam Collins Scott Associates. The system brings the steel fabricator and erector on board early in the design phase. Scratch the surface of any steel fabricator in the area, large or small, and likely you will find a jaded group of individuals fighting for survival. Set aside issues of a floundering economy and you begin to understand that the basis of their exasperation is generally related to matters of contracting. Successful projects are few and far between. That is, success as measured by their ability to service their customers in the timely fashion. The requirements of service invite extenuating circumstances that can render the fabricator ineffective in achieving scheduling goals. When you consider the magnitude of individuals involved and the paper trail maintenance required for each incident that must be documented during the detailing process, it creates a formula for scheduling disaster. With proper documentation one can establish responsibility, but, each incident has the potential to create cash flow problems for all the trades no matter who is at fault. In their efforts for aesthetic impact, the architect relies on the engineer to create the framework to support a given design. Efforts to do this and maintain building integrity often creates situations that are not completely workable. Solving these problems is the job of the steel detailer, hired under the umbrella of the steel fabricator and coordinated by the general contractor. The steel detailer, now a trade twice removed from the original source of the design, is forced to interpret the intent and create detail drawings to that effect. These situations are encountered by steel detailers on every project, and resolutions have an undeterminable timeline that generally do not work with project schedules. Each project begins with the plan of being able to make the required delivery schedule, effectively and efficiently. Steel delivery schedules can immediately be set off track by a steady stream of requests for information, partial drawing submittals and untimely drawing approvals. Documentation is the key element to placing responsibility. The need for this type of documentation is a foundation for anticipated litigation. For even if by some miracle the delivery schedule is maintained, the probable change orders resulting in the answers to the RFIs (requests for information) will require it, if the steel fabricator expects at all to recover its expenditures. Even the best project managers have a difficult time with this kind of record maintenance, and rarely get all the monies requested in the change orders that result. Is low bid a money saver? The lender, owner, design team and general contractor expect subcontractors on any given project know their own trades well enough to include in their package items not shown or indicated, though may be required, and to bid a job accordingly. 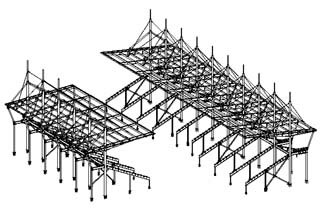 Structural steel drawings were finished for Mount Tahoma High School before the project bid. Plans shown here are for the school’s grandstands. This activity does not make a low bid. The low bid is the one that didn’t allow for the unknown or unforeseen, and is expecting to follow through with, and be compensated for, change orders later. This process is how contracting has been done for as long as most of us remember. It is a process by which the survivors are the ones that cover their losses by volume. The ones that die off are reborn as new subcontractors with less experience and continue to support that low-bid mentality. The team of architect, engineer and steel fabricator working together on the project design is ideal. Steel fabricators that are able to sell this approach have the staff and financial ability to do so. Design issues are worked out directly with the steel detailer, and the design work is complete prior to the start of construction, thereby avoiding any RFIs, change orders and scheduling problems. This approach will not work on public projects or on jobs where the owner needs to have the benefit of the open market bid process to obtain funding. Nor is it fussed with where few steel items are required. Having all the steel detailed before it goes out for bid saves the double markup from the fabricator and general contractor on the initial detailing cost. Also, by eliminating the need for RFIs, change orders, drawing approvals and re-submittals, it offers the same benefits of the design-build approach. The architect or engineer no longer leaves themselves exposed for possible litigation, and it is likely that the owner will not be at risk for additional monies for the sub trades. Use scheduling maintenance and the financial benefit that results from that as a selling point to the owner. When a timeline is down on paper for the owner, the result is a schedule that can be adhered to. Steel fabrication begins soon after the project is awarded, and there are no change orders to deal with. Any erection issues can be worked out early during the detailing process and field fit-up problems would be limited. The erector can move on site as planned in the original project schedule. This process is being done here in the Pacific Northwest as well as other regions, and for a lot longer than many of us realize. Lanny Flynn at Putnam Collins Scott Associates in Tacoma introduced the use of its “Integrated Steel Design” system with the Tacoma Pacific Tower, a 14-story building which topped out in January 2002. While Pacific Tower started as a design-build approach, the steel detailing was taken on by the engineer and completed. There were two RFIs on the job and it was erected in four weeks. 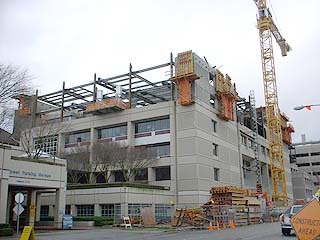 Another Integrated Steel Design project currently being erected is the Multi-Care Building in Tacoma. Soon to begin erection is the new Mount Tahoma High School, bid with structural steel drawings already complete last December. CTA Architects Engineers of Billings, Montana, staffs its own steel detailers and has been detailing steel projects for over three years. The firm uses the 12 weeks’ savings in schedule as a selling tool to the owners. Putnam Collins Scott Associates holds the trademark on the Integrated Steel Design system — which features complete preplanning of the building steel construction. This includes zoning the building for erection sequence, designing connections for ease of erection, designing the steel members for cost effectiveness and creating the steel detail drawings to match that plan. Having the benefit of fabricator and erector input in the design stage provides a good foundation, both in cost and schedule. Integrated Steel Design is the brainchild of Lanny Flynn, vice president of Design-Build Services at Putnam Collins Scott. Schedule is the basic selling point to the owners. Weeks, sometimes even months, are saved in most schedules by having the structural detailing already completed before a project goes out for bid. The steel for a project can be pre-purchased, bypassing any potential mill rolling impacts. This process, though still relatively new to this area, has proved successful in limiting cost overruns by minimizing or eliminating RFIs and change orders. Projects are completed on time without fear of litigation in the end. Their steel detailing department head has an extensive steel fabrication background, which is what makes the firm so successful. It details all the steel on the job, as well as the steel joist and deck. Rebar detailing is planned to be added as part of its offering as well. KL & A Inc. out of Loveland, Colo., is an engineering firm who has been doing its own detailing for eight years. Most of its steel detailing staff worked for steel fabricators directly. In the firm’s world, an RFI consists of a detailer and engineer looking at a computer screen and coming up with a resolution in a few minutes. By hiring a consultant for the first few projects, you can create for yourself a foundation from which a team can be built that works exclusively to suit your needs. All trades concerned are sure to benefit from having the design complete and the unknown eliminated. This process is best used for the entire steel package, projects both large and small. The design team on any given job could complete one project and go on to the next, without having to be constantly interrupted to resolve issues on jobs they thought were completed — and without concern for change orders or litigation. To continue contracting projects the way it has always been done costs us all our ability to work, let alone make money doing it. Offshore competition continues invade our borders with the seductive low numbers that we cannot compete against. By making the design teams complete, including the steel detailer, we can eliminate crisis management behaviors, restore contracting sanity, and give ourselves back the ability to service our customers. By keeping our work local we can build a better foundation for our own economic stability. Kerri Olsen, a steel consultant with 24 years of service, specializes in working with steel fabricators and general contractors providing project management, cost estimating, detailing, and litigation assistance. For more information, go to www.steelfabricator.org. The equipment dilemma: buy or rent? What is your construction company worth? Going to a happy place — work!